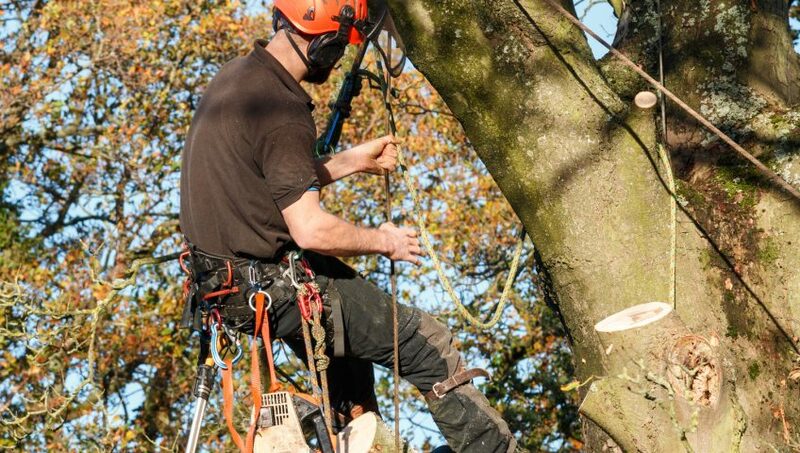 If you have never had to hire a tree surgeon before, it can be a daunting experience. Many companies advertise their services and offer similar pricing options, so what do you need to keep in mind when choosing a tree surgeon? What does the tree surgeon’s quote depend on? For most of us the cost is an important factor. Most companies will want to come in person to assess the job involved before they give you any estimate of the costs involved. 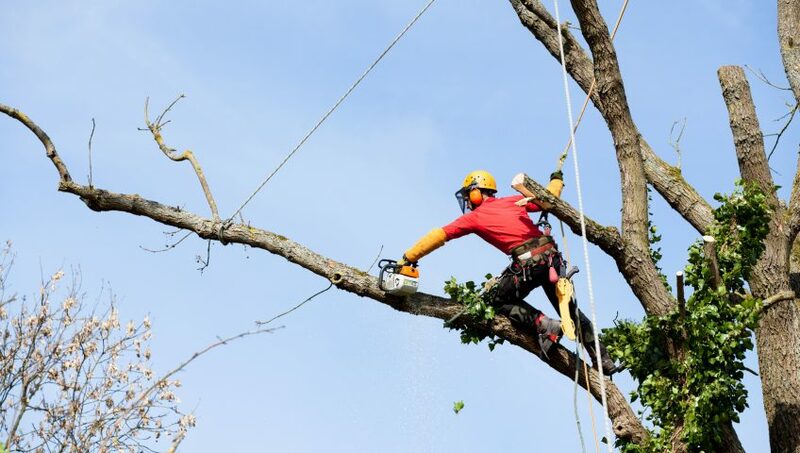 The cost any tree surgeon gives you will vary depending on the complexity of the project, the number of trees involved, the safety and ease of access to your property. If the job will involve getting permission from a local council or having to organise road closures around your property, you might have to pay a premium for that. Cutting trees that are larger, grow close to a property and require to be cut sectionally will cost more than removing small trees. How many quotes should I get? As with any other jobs, the advice is to get at least 2-3 quotes from different tree surgeons to compare. Do ask if the quote is fixed and includes everything involved or if there is a possibility that you might end up with extra costs. Beware of companies that give you a quote over the phone. The chances are they will increase it when they get there or even worse, after they have done the job. Should you go with the lowest quote? Unfortunately it is not always as simple as that. You need to be satisfied that the tree surgeon you are hiring has the experience and expertise to handle the job. They need to know how to prune the trees in a correct way not to cause damage. The most important issue, however, is that they have to keep you, your property and your neighbouring properties safe. Ask for a copy of their insurance, professional certificate and references from similar projects. A little time spent on this research can save you a lot of hassle if something was to go wrong. Should I hire a local tree surgeon? Local knowledge is important and a local company that you contact directly is more likely to be motivated to do a good job. There is a number of tree surgery price comparison websites, which compare the quotes for you. Sounds good in principle, In reality though, you talk to a call centre and have very little or no contact with the actual tree surgeons who will handle the job. Local tree surgeons survive on word of mouth, so doing a good job is vital for their survival. Hopefully this information will help you choose the right tree surgeon for your project. Do your research and choose the tree surgery company that you can trust. Remember that the cheapest quote does not always mean the best. With tree surgery high levels of service and safety are as important as the cost. Tree felling is a process of removing old, damaged or diseased trees. In the last few years storms and strong winds seem to be a regular occurrence. If you live in London, you might have read stories and seen trees that get damaged and become dangerous for the surrounding buildings, cars and people. 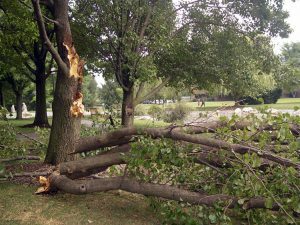 It is often very tall and large trees that fall victims to bad weather with full trees or large branches falling on pedestrian areas, causing injuries to people. If you use public transport in London, you know how often fallen trees cause obstructions on roads and rail tracks, causing severe delays. This is where experienced tree surgeons come in. Highly trained experienced tree surgeons have to handle complex tasks. It is a job that requires physical strength, ability to react fast and assess risks with engineering precision. Tree surgeons based in London have to perform tree felling almost on a daily basis. As much as everyone understands the importance of keeping London green, trees grow old, become damaged and pose a threat to people and buildings. Space issue and proximity of neighbouring buildings in London and other densely populated areas make tree felling a particularly challenging task that requires specialised training. Different techniques can be used depending on the space available around the tree. The tree surgeon should be able to decide if a directional or sectional method is the safest one to use. The directional method is faster, but it replies on having sufficient area around the tree to fell the tree in one piece. This is rarely possible in large cities. The sectional method is the one that most London tree surgeons would have to use all the time. It involves dismantling the tree into sections and lowering them to the ground using ropes and other devices. This method should not be attempted by anyone without proper professional equipment and training as it can be dangerous due to the height and the weight of the tree sections involved. More often than not trees grow within close proximity of buildings, their branches can stretch to overhead lines and could potentially fall on glass conservatory roofs, fences or pedestrian areas. Often there are obstacles under the tree and great care needs to be taken not to cause damage by lowering a branch or the whole tree at a wrong angle. Neighbours’ permission should always be obtained if the tree felling is likely to require the tree surgeon’s access to another property. Occasionally there is a danger that the work might affect public areas. In this case a council’s permission will be required to close off the areas that might be at risk. It is not always possible to carry out the work in unfavourable weather conditions. 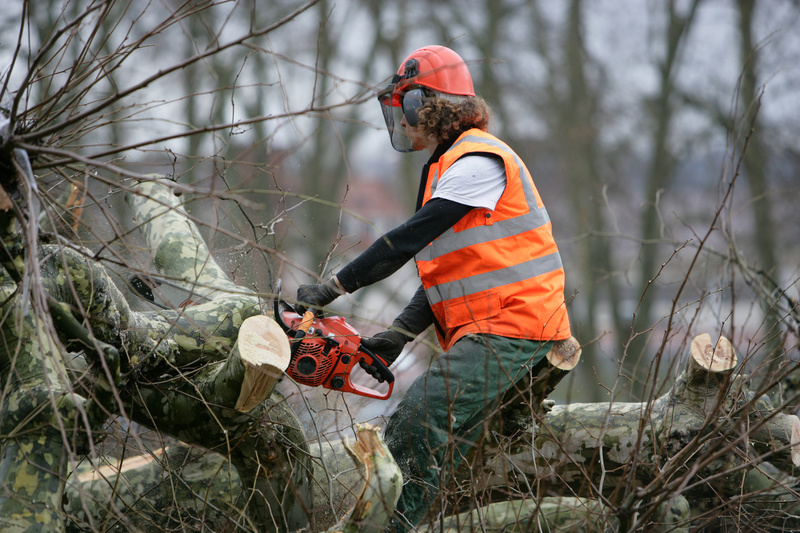 Strong winds and heavy rain can make performing the job unsafe for the tree surgeon as well as increase the existing risks of damage to property and people nearby. Even direction and strength of the wind can play an important part, making the tree surgeons work a lot harder or even impossible. Before tree felling, the tree surgeon will assess the condition of the tree, to see if there are any dry or broken branches that can potentially be dangerous. Pets, age of the tree or disease can change the density of the trunk and damage the structure of sections of the tree. These sections might need to be handled in a different way to the rest of the tree. Tree surgeons will take account of any birds and nests that might be active. All birds are protected under the Wildlife and Countryside Act 1981 so if there are any active nests, tree felling might have to be delayed. Cutting down a tree or a shrub that has birds nesting in it is an It is an offence that carries penalty or even imprisonment. Many areas in London are Conservation Areas and Tree Preservation Orders (TPO) might be in place. This means that a permission to remove the tree or do the work might be required from the local authorities. 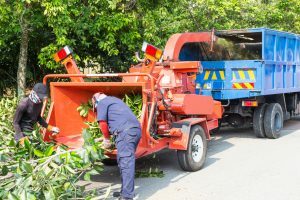 If the tree is dangerous these restrictions do not apply, but sufficient evidence needs to be collected to that effect before any work is undertaken. It is always advisable to get the council’s permission to avoid incurring penalties, which can be quite heavy. Tree Work solutions Ltd is your local tree surgeon company providing all tree related expert services to residents and businesses. We have served North London for more than a decade and are part of our local community with years of valuable experience in the field and skill-set to undertake any challenge with any level of danger involved.